Rio Grande’s Natalie Seeberg works through the Asbury defense to get off a shot in the second half of Tuesday night’s game against the Eagles at the Newt Oliver Arena. The RedStorm suffered an 86-69 loss. RIO GRANDE, Ohio — University of Rio Grande women’s basketball head coach David Smalley may not have the look of the stereotypical mad scientist, but the veteran bench boss of the RedStorm is being forced to re-invent his team after season-ending knee injuries wiped out 60 percent of its normal starting lineup. Tuesday night’s initial experiment against visiting Asbury University was far from a success. The Eagles took advantage of 23 Rio Grande turnovers and rolled to an 86-69 victory over the RedStorm in River States Conference action at the Newt Oliver Arena. Asbury won for just the fifth time in 19 outings and just the second time in nine RSC contests. 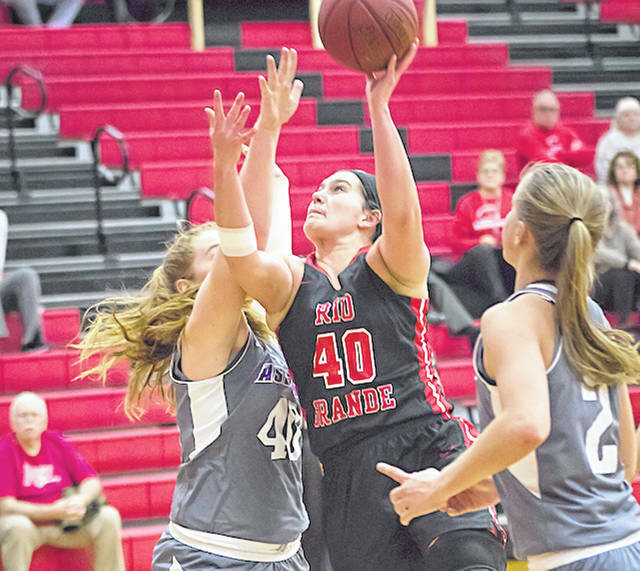 Rio Grande, which added junior guard Sydney Holden (Wheelersburg, OH) to its list of wounded warriors in last Thursday’s loss to WVU-Tech, fell for the second straight time, slipping to 13-6 overall and 4-3 in league play. The RedStorm’s 23 turnovers – which tied the team’s second-highest single-game mark of the season – fueled Asbury’s whopping 29-8 edge in points off of turnovers. The Eagles also helped their own cause with a season-high 13 three-point goals. Seven different players connected on at least one shot from behind the arc. Rio Grande trailed 19-13 with just over a minute remaining in the opening quarter, but went on an 11-0 run over the next 3-1/2 minutes to take a 24-19 advantage following a bucket by freshman Avery Harper (Seaman, OH) with 7:51 left before the intermission. However, Asbury responded with a 21-4 run of its own in a span of just over five minutes to open up a double-digit advantage and never looked back. The Eagles led by 12 points at halftime and by as many as 25 points on two different occasions late in the third quarter. Rio Grande scored the final 12 points of the third period and the first two points of the final stanza to pull within 11 points, 67-56, after a bucket by senior Chelsy Slone (Gallipolis, OH), but got no closer the rest of the way. All five Asbury starters reached double figures, with Autumn Herriford’s 22-point effort leading the way. She also had seven rebounds, six steals, five assists and two blocked shots in the winning effort. Kelsey Johnson added 21 points for the Eagles, while Ashlee Rose had 12 points and a game-high 10 rebounds and Sarah King finished with 11 points and a game-best six assists. Sarah Dennison also had 11 points for Asbury, which shot 50.8 percent overall (31-for-61) and committed just 12 turnovers. Senior Jaida Carter (New Philadelphia, OH) led Rio Grande with a game-high 23 points, while senior Whitney Gilkeson (Marietta, OH) added a career-best 12 points off the bench thanks to four three-point goals. Harper totaled 10 points in a losing cause for the RedStorm, which shot just 35 percent for the game (24-for-68), and senior Megan Liedtke (Beverly, OH) pulled down a team-high nine rebounds. Rio Grande returns to action on Thursday night when it begins a five-game road swing at Midway University.